Oral cancers constitute the fourth most common cancers amongst males and the sixth most common cancers in females. The incidence of oral cancers varies amongst different countries of the world and different regions within the same country specifying the role of environmental factors in the pathogenesis of these malignancies. Chronic tobacco usage has been attributed as a major risk factor in the causation of oral cancers. A strong causal association between cancers of the oral cavity and pharynx with the use of tobacco in any form and alcohol are well established now. Majority of oral cancers are diagnosed at advanced stages resulting in a poorer prognosis and survival rates amongst patients at the time of first diagnosis and intervention. In addition, despite advances in the therapeutic options, the morbidity and mortality rates of oral cancers have risen in the past decade leading to increased treatment costs and complications secondary to such advanced treatments. An early diagnosis of oral cancers is, therefore, critical in the successful treatment of the affected patients. Oral exfoliative cytology is a simple, non-invasive and painless procedure that involves microscopic analysis of the cells collected from the surface of the oral mucosa due to their exfoliation owing to a lack of cohesion, a characteristic of malignant cells. However, this technique also has some added disadvantages in the form of the unpredictiveness of the sample obtained, certain unavoidable technical errors and an incorrect interpretation of the findings. With advanced imaging techniques, computerised systems and the use of quantitative techniques to verify the reliability of the results, this procedure is gaining popularity once again. Exfoliative cytology can be used as a diagnostic adjunct in the early detection of such changes even in the absence of obvious clinical manifestations. Easy and fast implementation, adequate diagnostic value, non-invasiveness, cost-effectiveness and reproducibility are some of the definite advantages of this technique. There have been conflicting reports in the literature with regard to the effects of tobacco on oral cavity. The present study was, therefore, undertaken to evaluate the cytomorphometric analysis in such patients so as to predict their potential for future frank malignant conditions so that appropriate and timely intervention could avoid such dreadful sequel in such patients. Forty five individuals with either a habit of smoking or chewing tobacco and fifteen healthy controls were selected from the outpatient department for the study. The study group was in the age range of 20–60 years which was divided into three groups: Group 1 comprising individuals <25 years, Group 2 comprising individuals between 25 and 50 years and a Group 3 comprising individuals >50 years of age. All individuals having tobacco habit either in the form smoking or chewing tobacco were included in this study group. Individuals with tobacco-associated oral lesions with clinically evident co-existent haematological disorders were excluded from this study. Scrapings were made from the buccal mucosa with moistened wooden spatula smeared on to a clear glass slide and immediately fixed with 95% ethanol for a minimum of 15 min. The smears were visualised in ×100 magnification and focused on the stage micrometre scale. In all the cases, the nuclear diameter (ND) and the cytoplasmic diameter (CD) were measured in both horizontal as well as the vertical axes. Only clearly defined cells were measured excluding the clumped or folded cells. 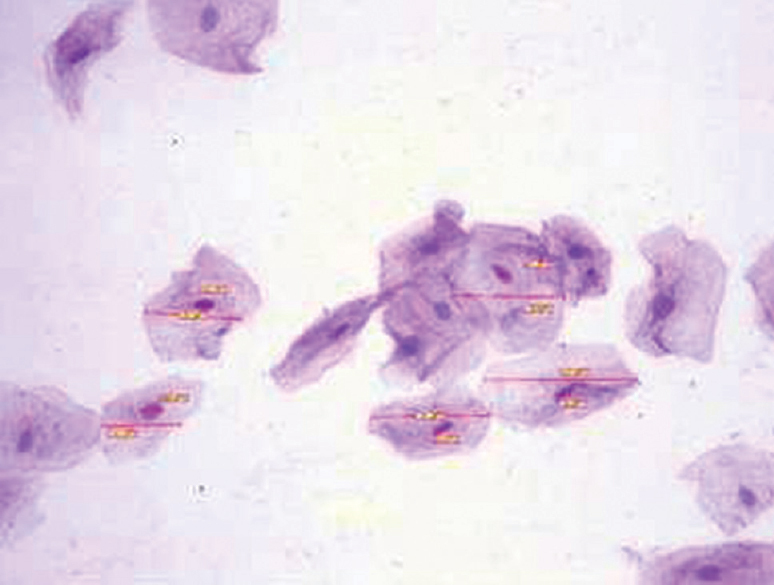 100 cells were measured from each smear and the mean ND and CD were obtained for each case [Figure 1]. The nucleo-cytoplasmic (NC) ratio was, also, calculated for each case. This study group was in the age range of 20–60 years which was divided into three groups: Group 1 comprising individuals <25 years, Group 2 comprising individuals between 25 and 50 years and Group 3 comprising individuals >50 years of age. The study individuals had a habit of smoking and/or chewing tobacco. The mean values of ND, CD and NC ratio were calculated amongst these groups [Table 1],[Table 2],[Table 3] and [Graph 1 [Additional file 1] ],[Graph 2 [Additional file 2] ],[Graph 3 [Additional file 3] ]. 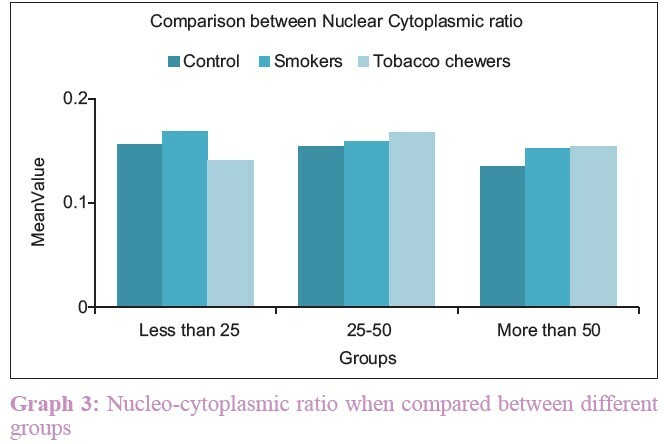 Statistically significant difference was observed in all the parameters between the control group, smokers and tobacco chewers. Oral exfoliative cytology is a simple and non-invasive diagnostic adjunct that can be used for an early detection of potentially malignant lesions. Variables such as ND, CD, NC ratio, nuclear shape, continuity of the nuclear membrane, optical density and nuclear texture are assessed by cytomorphometric analysis. All major forms of tobacco are known to have a cause-effect relationship with oral cancers. During malignant transformation, changes occur at the cellular and subcellular levels well before clinical changes become obvious. High-risk potentially malignant lesions can be identified well in early enough stages to reduce the mortality, morbidity and cost of treatment associated with oral cancers. In a study conducted on South Indian population, cytomorphological alterations in the form of a reduction in CD and increase in ND have been reported in buccal squames of tobacco users. In comparison to the non-smokers, there was an average increase of 5–16.5% in the ND as was reported in the smokers. In the present study, significantly altered values were observed for all the three measured parameters (ND, CD and NC ratio) in the group using various forms of tobacco. These changes were directly related to the duration and frequency of habit. Increase in nuclear size is considered to be a cellular adaptation in response to an oral epithelial lesion. As there is decreased turnover rate of the oral epithelial cells which causes the cells to remain in the cell cycle for longer periods, a subsequent delay in the cell division leads to an increase in the nuclear size. 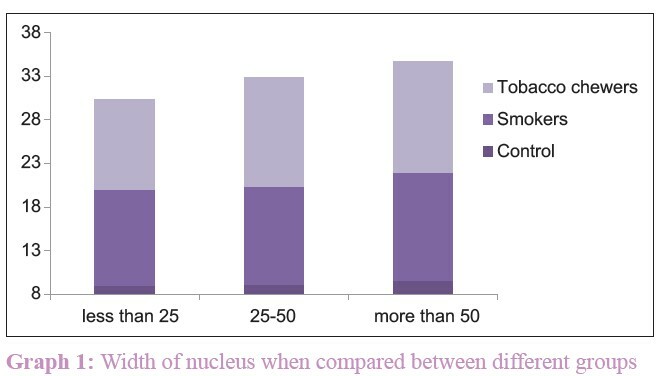 The size of the nucleus and cytoplasm decline with aging. The cellular changes seen in the present study can be partly attributed to the fact that tobacco on consumption releases various byproducts such as nitrosamine and nitrosonornicotine which can influence cellular morphometry. In tobacco chewers, there is a close contact of these byproducts, thus, facilitating their infiltration into the mucosa, which might be held responsible for the pronounced cellular changes seen in such patients. Another study reported that the ND of the cells in individuals, who had smoking habits, chewed betel quid and/or practised both these habits, was significantly greater than that of the control group. They also reported that the CD of individuals who chewed betel quid and practised both these habits was significantly smaller than that of the control group. The present study emphasises the importance of an early recognition of cellular alterations caused by tobacco usage. The results of the present study revealed a decrease in CD and an increase in ND and NC ratio in the cells isolated from the buccal mucosa and gingiva of tobacco users which could be used as early indicators of the dysplastic changes in the oral mucosa calling for an early intervention to prevent the development of frank malignant changes. Increase in ND and decreased CD as well as altered NC ratio appear to be due to tobacco and cytomorphometric analysis can be used to detect these cellular and subcellular alterations at an early enough stage before actually a frank, morphological change can be appreciated in relation to the affected oral mucosa. The authors would like to thank all the patients who contributed in the study without whom this study would not have been feasible. Ide R, Mizoue T, Fujino Y, Hoshiyama Y, Sakata K, Tamakoshi A, et al. Cigarette smoking, alcohol drinking, and oral and pharyngeal cancer mortality in Japan. Oral Dis 2008;14:314-9. Orellana-Bustos AI, Espinoza-Santander IL, Franco-Martínez ME, Lobos-James-Freyre N, Ortega-Pinto AV. Evaluation of keratinization and AgNORs count in exfoliative cytology of normal oral mucosa from smokers and non-smokers. Med Oral 2004;9:197-203. Sampaio Hde C, Loyola AM, Gomez RS, Mesquita RA. AgNOR count in exfoliative cytology of normal buccal mucosa. Effect of smoking. Acta Cytol 1999;43:117-20. Diniz-Freitas M, García-García A, Crespo-Abelleira A, Martins-Carneiro JL, Gándara-Rey JM. Applications of exfoliative cytology in the diagnosis of oral cancer. Med Oral 2004;9:355-61. Pektas ZO, Keskin A, Günhan O, Karslioglu Y. Evaluation of nuclear morphometry and DNA ploidy status for detection of malignant and premalignant oral lesions: Quantitative cytologic assessment and review of methods for cytomorphometric measurements. J Oral Maxillofac Surg 2006;64:628-35. Hashemipour MA, Aghababaie M, Mirshekari TR, Asadi-Shekaari M, Tahmasbi-Arashlow M, Tahmasbi-Arashlow F, et al. Exfoliative cytology of oral mucosa among smokers, opium addicts and non-smokers: A cytomorphometric study. Arch Iran Med 2013;16:725-30. Einstein TB, Sivapathasundharam B. Cytomorphometric analysis of the buccal mucosa of tobacco users. Indian J Dent Res 2005;16:42-6. Buch AC, Patel SS, Chandanwale SS, Kumar H, Patel KM, Sunita A. Study of oral exfoliative cytology in tobacco chewers of Western India. Int J Pharma Bio Sci 2014;4:138-43. Khot K, Deshmane S, Bagri-Manjarekar K, Warke D, Kotak K. A cytomorphometric analysis of oral mucosal changes in tobacco users. J Nat Sci Biol Med 2015;6 Suppl 1:S22-4.